HONG KONG.- Ooi Botos Gallery will present the 8irst solo show ever in Hong Kong of one of Chinas most celebrated, avant‐garde photographers, Chen Man. The artists solo exhibition Unbearable Beauty opens March 13, 2010 and runs through May 22, 2010 and will be the internationally recognized artists 8irst exhibition in Hong Kong. It will also mark the premiere of three new works, represented exclusively by Ooi Botos Gallery. Chen Mans unique, revolutionary vision was 8irst showcased in groundbreaking covers produced for Vision magazine from 2003 to 2007. These iconic images seared the memories of a generation and 8irmly established her as a pioneer. They also led to her 8lourishing career as Chinas most important fashion photographer. A graduate of the Central Academy of Fine Arts in Beijing, Chen Man regularly exhibits internationally in Europe, the US and China. In 2008, she participated in the prestigious Victoria & Albert Museums China Design Now exhibition in which one of her photographs was selected as the of8icial visual for the show. Her works have also been exhibited at the Salon National dArt Contemporain at the Espace Cardin in Paris; at In Fashion 08, curated by Patric Remy, one of the worlds leading photography experts, in Miami; as well as the Ullens Center of Contemporary Art in Beijing, in Chen Man: The Wall. In France, she is represented by Galerie Maeght. Not surprisingly, her provocative interpretations of feminine beauty and power have made her the photographer of choice for virtually all of Chinas leading magazines. Her work has appeared frequently in Vogue, Elle, and Harpers Bazaar, among numerous other Chinese media, demonstrating time and time again that Chen Mans images are de8ining the new face of modern China. Chen Man, born in 1980 in Beijing, studied graphic design and photography at the Central Academy of Fine Arts. 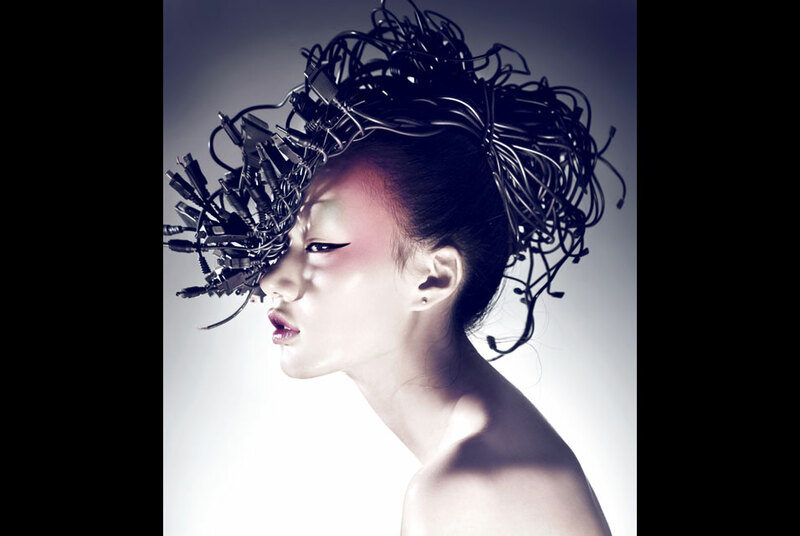 She is Chinas most innovative fashion photographer and a leading 8igure of the post‐80s generation of artists. Chen Mans 8irst covers for the in8luential magazine Vision in 2003 were immediately recognized for their originality, for Chen's artistry with a camera and for her technical masteryall fused to create Chen's own unique photographic vision. Only in her early 20s, viewers were dazzled by the sophistication of those early, stunning photographic works. Chen Man attends to all aspects of her craft including post‐production image creation utilizing such tools as 3‐D rendering. She has an extremely strong aesthetic eye that brings out the most in her subjects and models  many of which are prominent celebrities  and she consistently works with other creative talents such as famed make up artist Tony Li. Chen Man created covers for Vision magazine from 2003‐2007. She is also a regular contributor to such publications as Vogue, Nylon, Esquire and Bazaar. In 2008, she participated in the China Design Now exhibition at the Victoria and Albert Museum in London. Her piece Vision, image 12 was selected as the of8icial visual for the exhibition. Also in 2008, Chen Man created a specially fabricated screen, composed of giant photographs, for the Demolition Party  organized by Philippe Starck  at Le Royal Monceau in Paris. Only twenty international artists, considered to be amongst the most creative and original, were chosen to participate. Matisse Museum Shows Paintings by Robert De Niro, Sr.
Sargent Masterpiece Travels to Spain for Meeting with Velazquez's "Las Meninas"
Meadows Museum Presents "Royal Splendor in the Enlightenment"
Dolby Chadwick Gallery Opens Kirsten Stolle's "Anatomy of a Future Forest"
Fourteen Top Australian Contemporary Artists have Been Invited to Paint "Wilderness"